Okay! Musume Time: Waiting For Romeo - Houkago Princesses 'Juliet ~Kimi wo Suki na 100 No Riyuu~' Single Review! 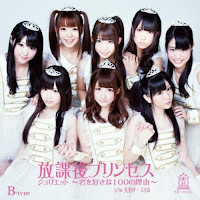 Waiting For Romeo - Houkago Princesses 'Juliet ~Kimi wo Suki na 100 No Riyuu~' Single Review! As a lot of you will already know, I am a fan of Houkago Princess - such a fan, that I actually went ahead and purchased their second indies single off of Amazon in MP3 format. You could say that I love the group, which I do - that, and the songs were nowhere else around the internet other than concert versions which were cut down to fit the videos that they were presented in. So, I bought the single - though in all honesty, I would have preferred a hard copy, but MP3's are by far cheaper and easier to get, and I'm honestly not complaining. I have these songs now and I am happy with my purchase. Props to the person who directed me to Amazon to purchase it, though! So, I've actually had the single for about a day now, and I have already written a review regarding the title songs cute PV back in February, and I loved it. But how does the single itself hold up? It's time for that track-by-track review! Juliet ~Kimi wo Suki na 100 no Riyuu~ is the leading track to HouPri's second Indies single and the official debut of Nagafuji Aoi and Kobayashi Rena, who joined HouPri at the end of last year. This is a very cute, romantic sort of song, with a very generic but nice Idol-type instrumental that fits with the image of Houkago Princess. It's not overly up-beat or toned down, but it's very nice and rather calming in its own way. If anything, Juliet ~Kimi wo Suki na 100 no Riyuu~ is a step up from their debut single, which was just as tame, but a tad less energetic. In all honesty, I adore this song - I've been playing it non-stop because I love how these girls sound. They all blend so well together, and the tune is really cute and a little magical as well. It has that princess-like charm to it, and I enjoy every voice in this, even Sakino, who dominates the solo lines (with a bone thrown at Nana and some scraps given to Mayuka). Yes, the line distribution is abysmal, but as someone said to me on a post I made once, what Idol group doesn't have terrible line distribution? But I kind of accepted the fate of HouPri when they debuted. I would have loved to see Rena and Aoi get a few lines, even if they were duets, but in the end they weren't. All in all, the first track of this single is very cute and I think a nice way to open up the single. It's not dramatic, but it works for me. The simple but cute tune and the romantic feel to the song is nice, and it is one of my favorites by HouPri. Daisuki is basically a romantic ballad. It's soft, slow and sweet with the sort of instrumental that makes you think of sad times. It's very calming and gentle, a song that I would listen to on a day where things were probably going wrong. This is probably one of my favourite songs from HouPri because of how gentle it is. It really showcases the softer side to these girls and how well their voices are together wehn they sing a song like this. It's really cute, in my opinion, and I do enjoy it. It actually reminds me a bit of a lullaby. One of my favourite parts of the song is when the girls all take turns in saying 'Daisuki', and one of the members says each syllable slowly (I think that she is Mayuka, maybe) and sweetly. That part is very nice, and made me like the song so much more. I also love how well these girls blend, though I do feel that Nana's voice is heard too much above the rest of the members in this song, but that's just a personal opinion, and maybe I am wrong. However, it doesn't really take away from the song, and I honestly loved her opening line - it was perfect. It's sweet and gentle, a perfect song for those sadder days or when you just want something nice to listen to. Pure Heart is present on the Limited A version of the single, and is sung by Team Black. For two of the songs, the girls were split into groups, with this one consisting of Nana, Mayuka and Yuuki (currently, I have no idea where Aoi and Rena are in these songs). In all honesty, I have not listened to this song as much because I actually don't like it very much during the beginning part, however the chorus is a lot better and, in my opinion, cuter, but the beginning of the song does take away from it, and makes me dislike it a little more than the other songs. However, for those who do like the sort of opening this has, then I think you will enjoy this single. My sister actually describes this as the sort of song that she would hear from a Persona game, but she doesn't like it - however when the chorus kicks in I enjoy the song more. I think that the girls' voices are cute, and they all really compliment each other, however this is not my favourite song. This is, for me, the 'miss' of the entire single. However, it is still enjoyable during certain parts of the song. The final song is Sukima, and is sung by Team White, which consists of Hitomi, Yumeka and Sakino. This song is one of my favourites by HouPri as well because of how cute it is. Like nearly all of their songs, Sukima is quite tame and gentle, however I love how Hitomi and Yumeka's voices stand out in this single when they sing together - it's great that the two deeper voices of the group were put together with one of the more cutesy-voiced members. I also think that Sakino sounds fantastic here - her voice is very sweet, but not to the point where I think that it is too cute and sickly. This song has a music-box like quality to it throughout the song, though part of instrumental takes a different sort of turn and gets a little heavier (heavy by HouPri standards, that is) with a guitar being played, from what I can hear, but it sounds good and I liked that it appeared towards the end of the song, rather than the beginning. This song is very cute and worth a listen. Houkago Princess are still a rather new group right now, and whilst their music does not appeal to everyone, it's something that I do like because of how cute and gentle their songs can be. No, Houkago Princess do not go to the extremes, and stay on the tame side of the fence in terms of their music. Their songs are rather generic and Idol-ish, but they are an idol group who are just starting out without a known company to back them up. For their second single, I think this is great, but that's my personal opinion - I know that not everyone will like it (like my sister xD). I think that, whilst the single not appeal to everyone, those who like HouPri or softer songs should give this single a chance. It showcases all of the girls' voices well, and the songs are sweet and simple. However, I would love for a more up-beat sort of single next time, or maybe even a moody, love-sick single where the girls are pining for their long gone lover. But until then, I will anticipate their next single release.